Nice! This is a good tool for Samsung 3DTV owners! 3D vision cant be on all the time because its put the TV to 3D mode immediatly even when there is no 3D aplications running like windows desktop. 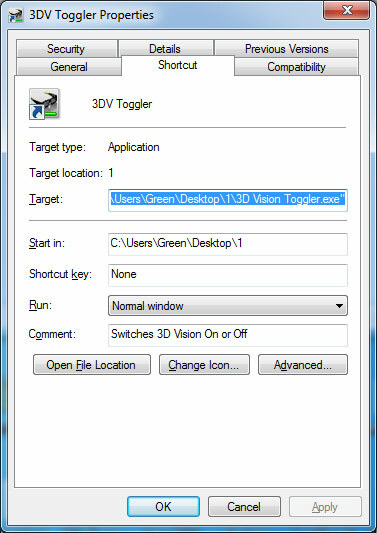 You can by default have links on the desktop (copy them from the nVidia Corporation folder in the start menu) to enable or disable 3D Vision, it’s much better than going to the control panel. Hmm.. I didn’t know that disabling 3D Vision completely would boost gaming performance in general. I’ve made a similar program using VS 2010. It requires .NET 4. It’s in both flavors x64 and x86. It sits in your taskbar and allows you to switsh 3D Vision on and off with a double click. Default state is off. I’ve made this about 6 months ago. Never seen any performance loss (yet never even thought about checking such nonsensical behavior), but that damn automatic 3D-mode overbright 35 -> 100 even in 2D-fullscreen mode just killing me. Shortcuts are good, but this is better. So always after running this program I must manually correct the path, and the program can’t remember it :/ So in my case it is not useful. I’ve done what NicMic suggested for the past 18 months, this toggler thing really isn’t necessary, i copied Nvidias own toggler buttons to my taskbar and have cool little icons. But helpful to those that didn’t know this none the less. well my main Problem with 3D Vision enabled is, that my Viewsonic needs a hell long time to switch between 3D mode and DVI mode and therefore when i play a game were i have to alt tab a lot it gets really annoying to alway wait ~3 secs to get the new picture. As for the standard nvidia shortcuts: the “problem” with those is, that they dont show if 3d is enabled or disabled wich my generated shortcuts do. @Gavinda Nice Program too, but for my u dont need the start an additional exe at ur system boot and the framework is also not required. and you can even edit it in the Ini file yourself and it should properly work. Is there anything similar for toggling SLI? Are you shure that we need something like this ? Nvidia already have this but it’s two different shortcuts. awesome…this is just what i was looking for! Cannot stop the program from creating a shortcut everytime. Changing CreateShortCut=false or changing ShortCutTarget= does nothing.